Panama’s coffee arrived with European immigrants in the 19th century, about 50 years after the country achieved its independence from Spain, but as an agricultural product it didn’t gain a real foothold until arguably the last 20 years. 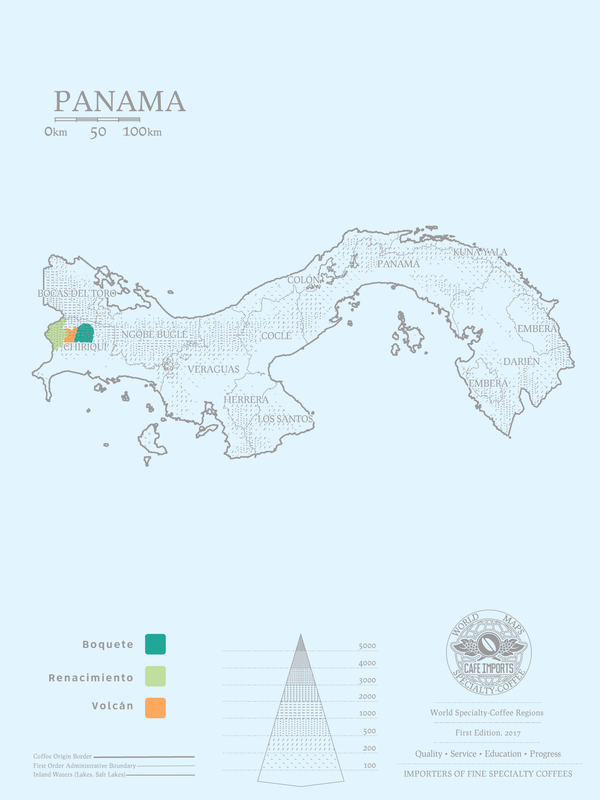 In contemporary Panama, coffee is primarily produced by smallholders from two main indigenous groups—the Bugle and Ngobe people—as well as mid- and large-scale estates owned privately, often by European or North American immigrants or their descendants. The coffee-growing regions comprise microclimates that are varied by soil quality (there is quite a bit of volcanic soil in Volcán, for instance) and altitude (from 1,000–1650 meters), and there tends to be ample fresh water for processing. The country itself has long been appealing to Europeans and North Americans in search of “idyllic” life in a beautiful, tropical, and relatively stable Latin American country, and the high demand for real estate, comparatively protective national labor and wage laws, and the large influence from the Global North have colluded to make Panamanian coffees among the more expensive to produce as well as to buy. Additionally, on the scale of global coffee production, Panama’s contribution is almost minuscule, and yields have been declining over the past few years. However, the coffees’ mild profile and approachable sweet/nuttiness continue to draw fans, as a nice foil to the higher and more dynamic acidity of other Central American coffee profiles. Since the early 2000s, the words Panama and Geisha have been almost synonymous: The variety was “rediscovered” in Boquete on the now-famous farm of Hacienda La Esmeralda, owned by the Peterson family. In 2004, the Petersons selected and separated the Geisha cherries on their farm, entering them in the Taste of Panama competition: They quickly gained the attention of the entire specialty-coffee world, and soon Geisha lots from Esmeralda were fetching upwards of $140/lb green at private online auctions. The incredible success of Geisha for Esmeralda has naturally inspired other producers to isolate their varieties, and even to plant new Geisha trees on farms where there were previously only Caturra and Bourbon. Geisha has also spread from Panama to other producing countries, where enterprising farmers are hoping to capitalize on the name and that unmistakable floral, tea-like, delicate profile. * Note: Unless otherwise specified by a producer, Cafe Imports prefers to spell the cultivar’s name its more traditionally accepted way: Gesha. The cultivar on Hacienda La Esmeralda typically takes the spelling Geisha, and is an exception to our general rule. For several years, Cafe Imports has primarily brought in Washed and Natural lots of Caturra and Geisha coffees from Panama, but more recently, due to what we’ve seen as a drop in both demand for the coffees as well as in some cup quality (and higher prices), we have limited our imports from this growing region. We remain hopeful that strengthening relationships with producers there and seeking out new and innovative coffees on the ground will see a triumphant return to fine coffees from Panama to our offerings list, in full force.